Do you have chronic headaches, pain in your face and around your ear? 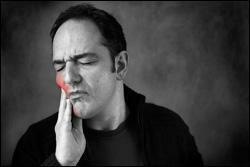 It’s possible you could be having problems with your temporomandibular joint, also called TMJ. It is the joint that connects your jawbone to your skull. It is also a unique joint that moves like a sliding hinge, and because of its unique movement, it can shift into a bad alignment and become inflamed. TMJ problems can result in damage to your joint, and much of the damage can occur while you are sleeping. If you are under stress, you can also be clenching or grinding during the day and be totally unaware of it. To provide consistent relief and prevent damage to your joint, Dr. Richardson will create a mouthguard custom-made for you, designed to prevent clenching and grinding and relax your jaw. In extreme cases of TMJ problems, surgery may be indicated, but it is always a last resort. If you have TMJ problems, don’t suffer! Get help before you have joint damage. With a custom-fit mouthguard, you are preventing damage to your TMJ. Call Dr. Mark E. Richardson in Kalamazoo, Michigan and find out more about how a custom-fit mouthguard can help you. Call today and get some relief!